I found myself out dancing last night. Head bopping to Shakira, I looked around the setting. What city were we in? We could have been anywhere. A DJ was at front while the Germany-Uruguay game played behind him. Neon green lights darted across the room, hitting a sleek white bar in the back packed with late night revelers. I was dancing with new friends, friends of Daniel’s, friends of friends from home, and some people I hadn’t even been properly introduced to yet. It was expat night at the Blue Frog and while we were surrounded by a sea of Indians (dressed very differently on the inside than perhaps many would on the outside) but a little enclave of outsiders had formed in the middle. Here I was, someone who normally hated clubs (even if I love dancing – the two don’t usually get to go together due to the massive crowds in New York clubs) and I was having a great time. It was my first real night out and I’d been able to wade through it with a little help from the community I now belong to. While I live in Mumbai and I’m trying to experience it to the fullest, I can’t deny that I live in a second world as well – I’m an expat. The expat community of Mumbai lives in the same city as the native Mumbaikers and the millions of Indians who come from all over the country. Yet they have their own way of flowing through the city while still creating their own space in a crowded metropolis. Expats are like a venn diagram. Every circle interacts with the Indian circle in its own way – on the street, through their jobs or volunteer work, through slowly learned Hindi – but there’s always going to be a portion of an expat circle that stands alone. And so, they all stick together – giving each other advice, living in the same few locations, and crowding certain bars and restaurants. They establish outposts in the city. Living in Scotland for four years in college never felt like this – I was part of the University community, I belonged. And I was proud that I tried my hardest to make friends primarily with British people (and not corner myself off into an American clique). That felt important to me then – what was the point of going abroad if you only wanted to hang out with people from home? In a non-University context and in a culture clearly much more different than that of our neighbors across the pond, I think it’s okay to admit that the situation here is different. 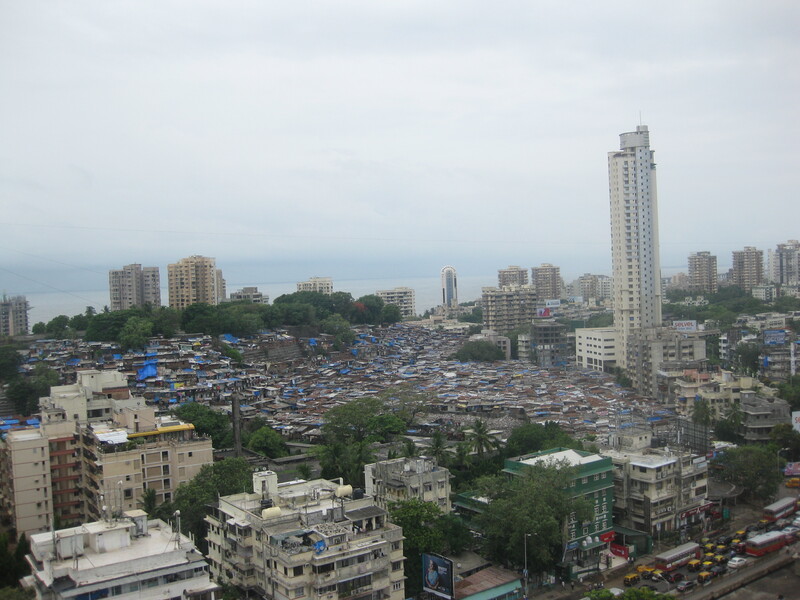 Here I’m more of a fish out of water – and while it’s admirable to hope that I can immerse myself into Mumbai and it’s people, it would be naive to think I didn’t need the comfort of the built-in community in front of me. You can make friends on both sides of the aisle here – but as an expat it would be hard to fight the natural inclination to befriend people who a) understand you but b) also are always happy to have and accept new friends, since theirs are always coming and going. Young expats here are transient. Most come for months or at most years, so being a new person is part of the natural expat life cycle. Luckily for me, it’s been hilarious realizing that most of the young expats in Bandra are all connected. A girl I was put in touch with through an Andover connection happened to be living with one of Daniel’s old friends who was in Mumbai. They invited me out last night with a guy who I’d already been put in touch with through another friend from home. And a friend of Daniel’s from work who is also living here is now temporarily living with a girl who turned out be someone Daniel had known in high school. Just when I thought I didn’t know anyone, everyone I COULD know already knows each other. It really puts the phrase “It’s a small world”, into a funny context. The friends issue been one of my larger fears moving here – how can I leave my great life with my great friends to go move somewhere where I don’t know a soul? But it’s the expat openness that makes those fears start to recede, even in these early stages where I’m still pretty much on my own (with Daniel of course). Listening to American pop music in a bar with my own enclave, even for a night, makes it seem like even when the whole world is in front of me, I’ve got pieces of home standing squarely behind me. “Oh these rains? This was just a drizzle compared to the pounding that’s coming soon”. That’s how my second night ended – thinking I had survived the first afternoon of monsoons only to be told that we hadn’t seen anything yet. I was prepared to write about and post video of the unstoppable and sustained violent rains I had watched through the evening. However, as I’m learning, it’ll take me a long time to see what Mumbai has in store. But long before the monsoon, we were awoken at 4am by the arrival of Phoebe, our dog, fresh off her flight into Mumbai. Daniel opened her crate and she shot out. She was embracing Mumbai because it wasn’t a confined space on a plane. And with that early morning arrival our little Mumbai family was complete and ready to look for a home to make our own. And that search was to be the focus of our day: find an apartment. Make sure it’s clean. Don’t get ripped off for being foreign. We were greeted at 10am by our broker. She immediately came off as a powerhouse. She made demands of brokers we were meeting into her iphone: “”Is it a renovated exterior? Or a dilapidated exterior? Because we only want new”. 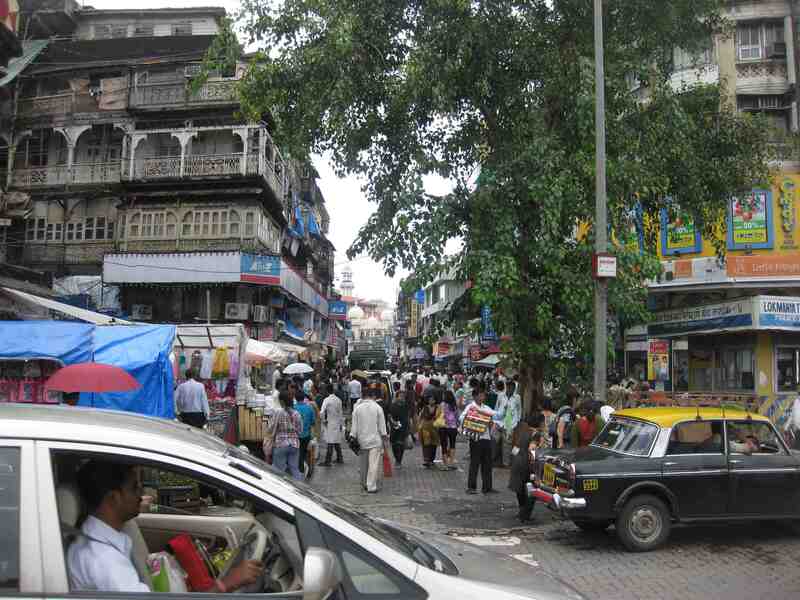 And so we drove into Bandra, one of two areas we are considering. It’s the northern suburb that has become a small city in itself. Tree-lined streets and colorful sidewalks play host to varying apartment buildings and restaurants of every possibility. We went to apartment after apartment. We learned early on not to let on to the countering brokers what our highest limit was, because suddenly every apartment would cost that much. Some exteriors WERE dilapidated by any western standard. But they still held home to brand new interiors and expensive rents. Others were a beautiful shell hiding dingy bathrooms, peeling ceilings and lizards running up walls. Our broker made demands of the other brokers in Hindi, Marathi and English. After noting a few buildings we liked, I finally fell in love in the most unexpected place. Despite saying off the bat that we didn’t need a view (“we’ve never had one in New York so it doesn’t matter to us”) and that we wanted a new looking building, we walked into just the opposite. The exterior was fading and peeling. Rain stains were visible on the paint before you even walked in. But it looked out onto Bandstand’s beach and the promenade and I saw myself suddenly seeing character and charm in the beachy building. Once again, in such a short 2 day span, Mumbai had taken my expectations and turned them on their head. 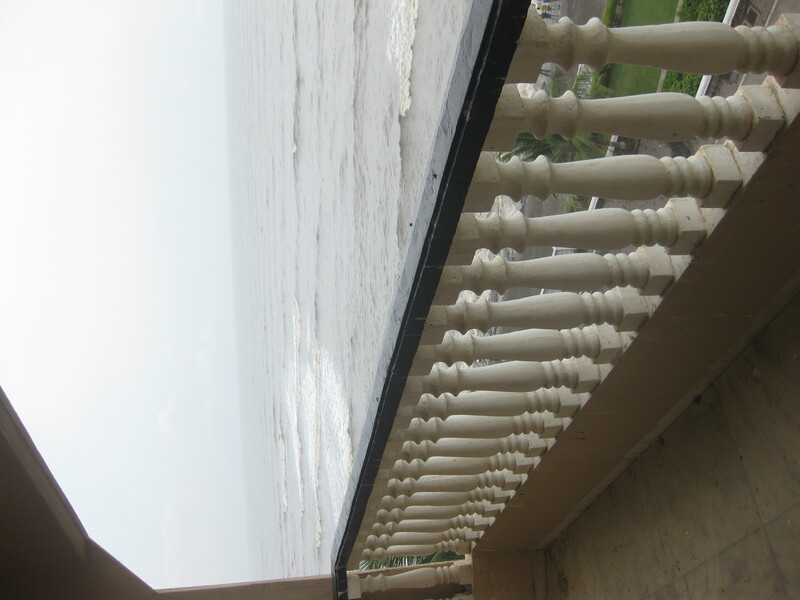 We walked in to an apartment that was kitschy and beachy and pure India. I would never decorate an apartment like this one on my own, but for our time here it seemed to feel right. And looking out at the beach view I felt this was an oasis of calm in a crazed city. I’d still have to convince Daniel and our broker still wanted to show us buildings in the Central Belt, but I was hooked. It truly feels like the new Mumbai – everywhere you look you see structures of building rising quickly among cranes and scaffolding, itching for occupancy in this growing part of a metropolis. I looked out of one building and saw a large swath of slums in between where we were and the newer buildings on the water. I ask the broker: “What happens when the developers inevitably want to build where the slums are?” “Some developer will probably just set fire to them if the people in the slums don’t negotiate. It’s sick”. I just kept looking out the window to the complete dichotomy that faced the old and new residents of the central belt. We went last to a building adeptly named “Planet Godrej”. It was huge. And coming from New York I believe that’s saying a lot. It was 5 towers of 50 floors. A massive space overlooking massive grounds that held the aforementioned pool and gyms and squash courts and gardens. It’s so new that Tower 5 is still under construction. 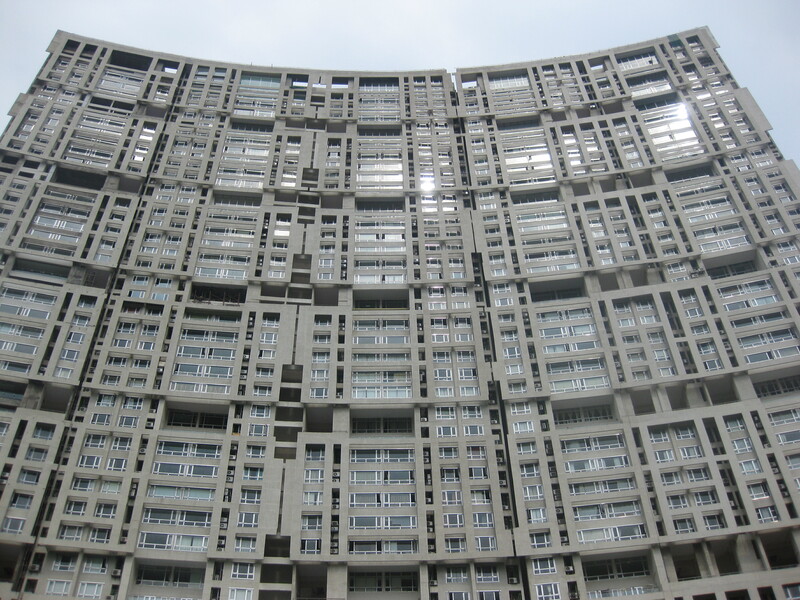 But the apartments inside were gorgeous and the definition of modernity. Marble floors, even layouts and floor to ceiling windows looked out onto the racetrack and the sea. 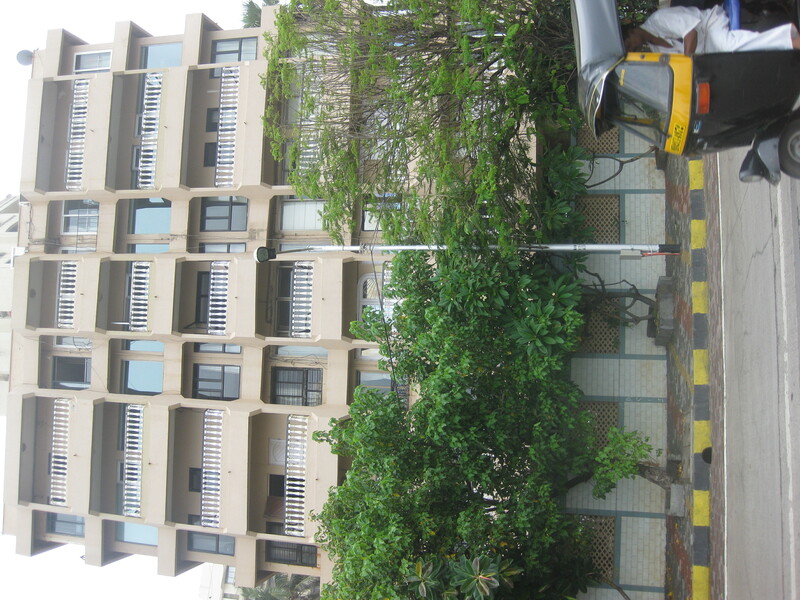 Yet the building I had expected to love was paling in comparison to my kitcschy beachy yellow-walled Bandra apartment. We drove away and prepared to see more tomorrow. And as we did the rain began to fall. With it, people came out – overjoyed that the oppressive heat of summer was ending and monsoons were coming. I’ve always seen rain as a nuisance. It blocks my quick walk up avenues and afternoons in Central Park. In Mumbai this sentiment doesn’t appear to exist. Rain trumps heat. Three months of rainwater provides showers and drinking water for the entire year. Hands reached out of taxis to touch the rain. Men women and children walked through the streets – some casually holding umbrellas but others just grinning and bearing it. I’ve never seen so many people walk through a torrential downpour as casually as if it were a sunny day. We were meeting our friend Elise for dinner but traffic stopped us. How can you move in a 3 wheeled rickshaw or a 20 year old car when rain is beating down faster than you can imagine? The slow traffic of Mumbai halts in the rains and I’m starting to wonder how we’ll survive the next 3 months of daily rains and constant floods. But a dinner of Indian seafood and a familiar face quashed my fears. And as we drove back the rains stopped and I could see Mumbai once again. It feels like we’ve been here forever but tomorrow will just be our 3rd day. I’m ready for more monsoons and more apartment hunting and, hopefully, I’ll end my next day having convinced Daniel to move forward in my little oasis of calm.